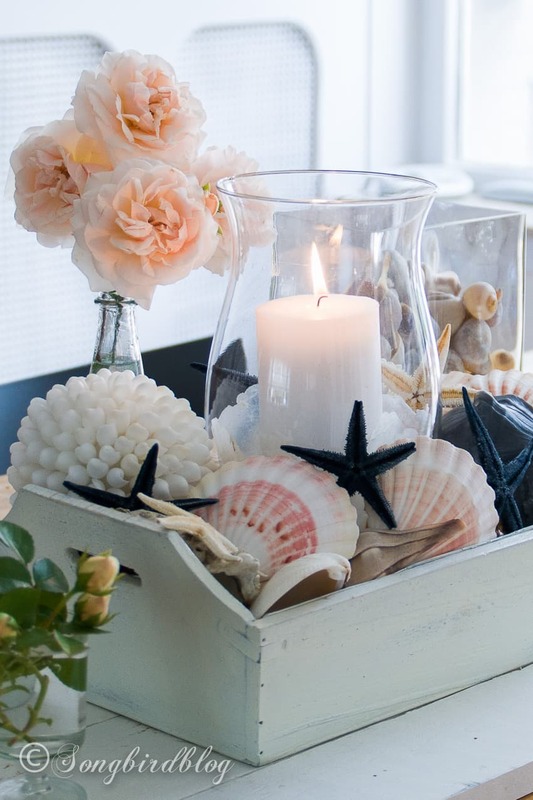 Nautical decor with beach finds, shells, sea stars and roses. Anyone can make this nautical decor. It is easy, but beautiful. Collect shells, sea stars, and candles and pile them all up in a wooden box. Add some mini bouquets of roses and you are done. It’s an easy nautical summer centerpiece with wow factor. Goodday my sweets. I’ve caught a bug. A summer bug. The “I am decorating for summer” bug. I know I am late in the game, but our weather has been the best excuse ever to procrastinate on adding summer decor. But now that the sun is finally out and the temps are up, I am in full swing and in the game. Today our table got a little something something…..
A bit of nautical decor. You might even call it a beachy vibe. It was a quick and easy decorating setup. I just piled all the shells I had left after my summer beach mantel decorating, into a box, added some flowers and called it a day. The contrast between this little vignette and my yellow pine table (it is on the list for a makeover, problem is that list is quite long), wasn’t big enough. So I laid down some of the leftover white painted pallet boards, and pretended I had a white table. Much better contrast. Makes things pop. [UPDATE I did get around to giving my table a farmhouse makeover]. This is a new rose from my garden. It is blooming for the first time and I am loving the soft subtle peachiness of it. It is in nice harmony with the soft pinks in the shells. The big glass canister is filled with another type of shells, of should I say houses. Those are snail homes. But they look like shells……. so I thought it was okay. I bought a big bag of them at the discount store. I loved their color tones, so home with me they came. Those snail houses shells are they only new thing in this whole setup. The rest is old, thrifted, found or stolen from my own garden. Love that. The little sea stars, come from a batch I bought years ago at a flea market. I think the people selling them, fished them out of the sea themselves. The sea stars still smelled rather fishy even after all those years. However soaking them in bleach water for a long time got all that nasty smell out. For this particular nautical decor I dyed a few of them blue, with regular old Dyson fabric color in the color denim. I read ages ago that you could do that, but never realized just how easy it is. If you want to dye some sea stars all you have to do is mix up the paint (put gloves on!!!!! ), soak the sea stars and let them dry. Easy. No decoration without a candle……..
Yeah it is summer here at the nest.………..
Oh, you are inspiring me! It’s finally sunny today, here, too. I have shells, I have containers – I can do this. What a brilliant idea to dye the sea stars. Brilliant! I’m looking for something sea side-ish to round out my shelf in my bedroom! I just picked myself up a chunky pine tray similar style to the one here at the opp shop (thrift shop) and have been wondering what colour to paint it. I just don’t think I can go past white after seeing that cute tray. This is beautiful Marianne. I like how you dyed the sea stars too.